ActioNet, Inc. is committed to creating an employee environment that fosters professional development, as well as personal growth and satisfaction. Through our total compensation package, we offer our employees the means to reach these goals. ActioNet, Inc. offers a comprehensive benefits package that includes health insurance dental insurance, life insurance, professional training reimbursement, 401K, disability insurance, and much, much more! ActioNet, Inc. understands that to recruit and to retain the best and the brightest we must continually offer benefits that meet our candidates and employees’ needs. Annually, we review our benefits to determine if the best possible packages are in place for the upcoming year. We offer plans to fit your circumstances with four levels of coverage. You can insure yourself or your whole family. Most of our benefits begin day one of your employment. We offer our eligible employees two national, quality options for health care. Both plans are POS plans which allow you to choose a provider that is within or outside the network. Both plans also provide a prescription drug program, which includes a mail order plan as well as vision care. Our dental plan provides both in and out-of-network options and from preventive to major restorative services. Orthodontia coverage is available with no age restrictions! Although ActioNet offers a comprehensive vision plan covered through our POS plan, we also offer a more comprehensive plan to meet your vision needs. This plan provides extra coverage and discounts for lenses, frames, lenses, contact lens and Lasik. Employees receive basic life of 1x annual salary (up to $100,000) fully paid by ActioNet. Would you like to insure yourself with more coverage? Want to cover other family members? Coverage is available under our supplemental life insurance plan. Employees can elect this coverage for themselves for a maximum of 5 x annual salary (up to $500,000). If supplemental life insurance is elected, dependent life insurance is available for spouses (50% of employee benefit, up to $100,000), and children (50% of employee benefit, up to $10,000) as well. Any of this may be subject to medical underwriting. The premium is fully paid by the employee for this election. If an employee is disabled beyond the elimination period, because of a covered injury or sickness, that employee is eligible to receive a weekly benefit of 60% of basic weekly income to a maximum benefit of $2,500. This benefit is fully paid by ActioNet. If an employee is disabled beyond the elimination period due to a covered injury or sickness, that employee is eligible to receive a monthly benefit equal to 60% of basic monthly income, up to a maximum benefit of $7,500. This benefit is fully paid by ActioNet. We offer a 401(k) plan with tax advantages, generous company contributions, and a variety of investment funds. Employees are eligible to participate on the first day of the month after their hire date. ActioNet offers both medical and dependent flexible spending accounts. Employees save money by allowing funds to be set aside with pretax earnings annually on eligible healthcare and dependent care costs. Employees commuting into DC may set aside funds with pretax earnings on all eligible work-related parking and transportation commuter costs. Employees accrue fifteen days of paid time off annually at ActioNet and increase leave by one day on every anniversary with the company up to 5 years. Additionally, we observe ten (10) paid holidays per calendar year. ActioNet provides an EAP program for the use of both our employees and their dependents at no cost. Resources aimed at helping employees and their dependents in a variety of areas such as: counseling, crisis intervention, research & referral, training, and financial & legal assistance. We provide every employee $3,000 in education/training reimbursement per year. We believe in recognizing the great work our employees do as often as possible. ActioNet strives to make sure you know how much you mean to us with incentive and merit awards. ActioNet offers its employees membership with the NASA Federal Credit Union and casual dress Fridays. ActioNet also offers military leave, bereavement and jury duty leave. ActioNet Inc. is an Equal Opportunity/Affirmative Action Employer. * Note: Benefits are available to all regular full-time employees. ActioNet reserves the right to modify or terminate the plan at any time. ActioNet knows that employee achievement, satisfaction, growth, and development translate to company success, morale, growth and development. To that end, we are committed to providing our employees with opportunities for career development. Investing in employee growth and development is a top priority at ActioNet, Inc. We strongly encourage our employees to seek continuous education, training, and career development. To ActioNet, career development is not a one-time training course or education class; instead, it is an ongoing process of growing both personally and professionally. We, at ActioNet, provide a work environment that fosters career and personal growth and satisfaction. The following programs and practices assist us in this ongoing endeavor. 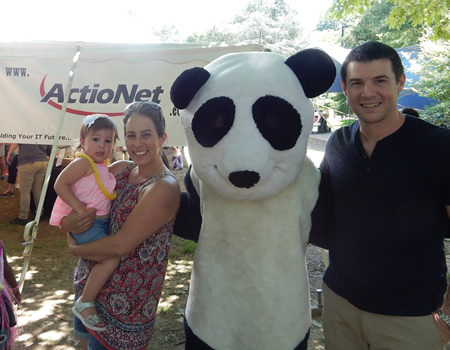 ActioNet sets up a generous education fund for each of its employees. Upon taking educational classes, employees are reimbursed for items such as tuition, books, and technology fees. We encourage our employees to maximize this benefit each year by taking educational classes that are interesting, further their career and broadens their horizon. ActioNet sets up a generous training fund for each of its employees. Employees are reimbursed for such items as training costs and books. Employees are encouraged to maximize this benefit each year by taking training classes that are interesting, further their career development and broaden their knowledge base. ActioNet strongly encourages its employees to attain professional certifications; the attainment of a professional certification assists employees in furthering their career by enhancing their marketability. ActioNet provides reimbursement for certification preparation courses and certification tests. ActioNet strives to create an environment that supports and encourages clear and open communication and constructive feedback. Each employee is given an annual performance appraisal to encourage open communication, provide employees with performance improvement plans and to recognize and reward employee accomplishments. ActioNet provides its employees internal training. The training is free and it is often provided during company time. ActioNet is committed to making learning accessible, motivating, and educational. The Mentor – Protégé program offers new employees the opportunity to work with more “seasoned” ActioNet employees. The intent of this program is to help new employees learn how ActioNet does business and to provide assistance in their professional and personal growth, overcome obstacles, and obtain sound advice and guidance. ActioNet gives its employees the opportunity to learn, grow, and advance their careers by promotions and transfers. We are firmly committed to growing our employees. Position transfers and promotions are a vehicle that increases the knowledge, motivation, and satisfaction levels of our employees. ActioNet is excited at the prospect of employing young, motivated, and success-driven individuals that are just starting out their career. We offer these individuals internships and co-educational opportunities (refer to the FAQs for more information). ActioNet believes that our future success lies within the development of young professionals. To this end, ActioNet is interested in employing college students, in the form of a Co-educational or Internship capacity. Candidates that seek these opportunities should send their resumes to recruiting@actionet.com. Within this email, include a cover letter that states the type of opportunity you seek.